Last month, the MANjr team went out to Charlotte, North Carolina for a pretty sweet Toyota event. Toyota Motorsports sponsors NASCAR racer Martin Truex, Jr. and pro bass fisherman Mike Iaconelli, and the two guys got together to teach each other a thing or two about their respective sports. Martin Truex, Jr., who drives the No. 56 NAPA Auto Parts Toyota Camry in the NASCAR Sprint Cup Series for Michael Waltrip Racing, is a two-time NASCAR Nationwide Series Champion. His father, Martin Sr., also raced the No. 56 car in the Grand National Division. Truex Jr. began racing when he was 10 years old. During his first race for Michael Waltrip Racing, Truex earned a sixth place finish in the Daytona 500. He has 13 wins, 59 top tens and 10 poles in the NASCAR Nationwide Series and 1 win, 43 top tens and 5 poles in the Sprint Cup Series. Martin’s younger brother Ryan Truex competes for Michael Waltrip Racing in the NASCAR K&N Pro Series East. Both brothers competed in a Nationwide Series race at the Charlotte Motor Speedway last month. Ryan finished in 37th place and Martin earned a second place finish. Mike Iaconelli is ranked as one of the Top 20 Bass Anglers in the World. He hosts the show “City Limits Fishing with Mike Iaconelli” on the VERSUS Network. Iaconelli started fishing at an early age, and he parlayed an early interest in bass fishing into a solid career as a pro angler. Iaconelli was the 2003 Bassmaster Classic Champion, the 2006 Bass Angler of the Year and he earned a 2nd place finish at the 2009 Bassmaster Classic. While earning an Advertising and Public Relations degree from Rowan University, Iaconelli worked as a disc jockey. He collects vinyl records and he’s known for his trademark scream when he reels in a big fish. So Martin Truex, Jr. met with Mike Iaconelli at the Charlotte Motor Speedway in order to teach him some pointers about NASCAR driving. Weather conditions didn’t permit the use of the No. 56 car, so Martin took Mike around the track a couple of times in the Toyota Hybrid Pace Car, which paced the Coke 600 in 2009. After a couple of laps around the track, Martin and Mike switched spots, and the professional angler tried his hand at racing. 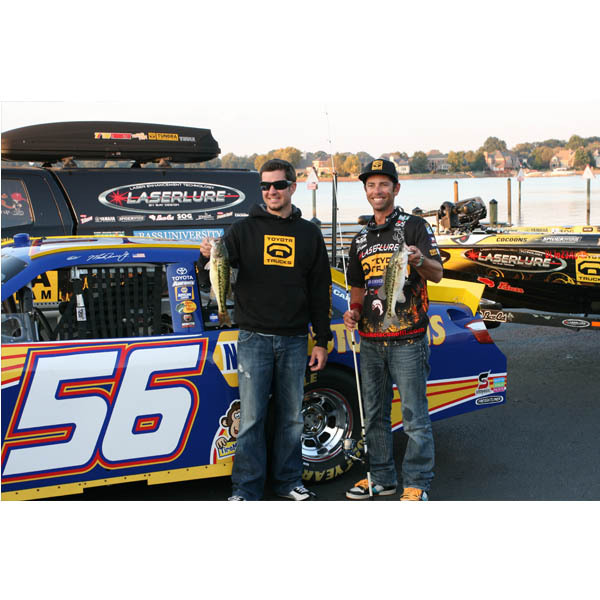 After Iaconelli got to experience the fast track at the Charlotte Motor Speedway, it was off to Lake Norman. The weather cleared up and it turned out to be a gorgeous day on the lake. It was a definitely a change of pace from the racetrack as Mike showed Martin some pointers on how to catch bass. The pro bass fisherman caught quite a few before Truex reeled in his first catch. You could tell that both guys really enjoyed the experience of testing out another sport and getting an education from a seasoned pro. The entire MANjr team has a new appreciation for bait and NASCAR turns. Special thanks to Martin, Mike and everyone from Toyota Motorsports for letting us tag along in Charlotte! Print article This entry was posted by Chris Stout on November 1, 2010 at 9:29 am, and is filed under Sports. Follow any responses to this post through RSS 2.0. Both comments and pings are currently closed.